Today’s post is going to be another celebrity FOTD! You can read my previous post in this segment HERE. 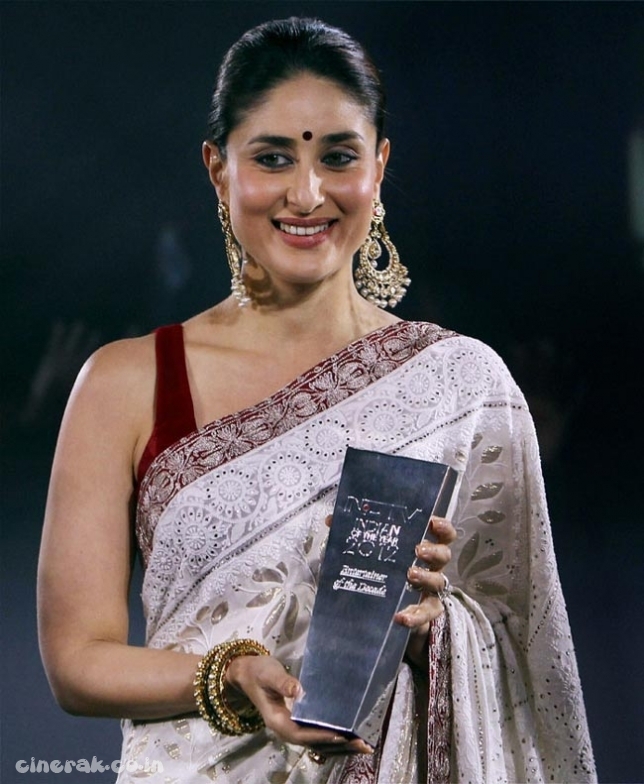 I recently came across this picture of kareena kapoor at the NDTV Indian of the year awards. I loved her simple makeup look and her traditional avatar! Let’s see the breakdown of her makeup! Her foundation doesn’t seem to have a dewy finish instead a matte finish with her cheekbones highlighted well. A product like MAC’s soft and gentle would do the trick. Her blush shade is a peachy pink one and something similar would be jordana powder brush in coral sandy beach REVIEWHERE. As for contouring, I do not see any except for a slight it on her nose area. Her eyes go pretty much on a neutral vie with nothing special but somehow being able to make it look put together. The eye look is similar to a tutorial i have done HERE. As for eye liner, there is no liquid liner used. Instead kohl is smudged and slightly flicked in the ends. Same applies for her lower lash line! You can see how to smudge kohl on the upper lash line in this tutorial HERE. It clearly looks as though she has skipped falsies and opted to sport her natural lashes. As for her lips, it seems as though she has a brown shade of lipstick with peachy undertones to it and the lipstick seems to have a frosty finish and she hasn’t worn any gloss on top. Can any of you suggest other products similar to what she has on? The eye look is an everyday kind of look and you can notice how its amped up with the lip. I liked her makeup but her skin is looking gritty and not glowy..